I am over the moon with all of the positive comments and emails I have been receiving from my readers lately. It makes writing my blog post each day even more fun. Thank you to everyone who takes the time to stop by and reach out. I truly appreciate it! 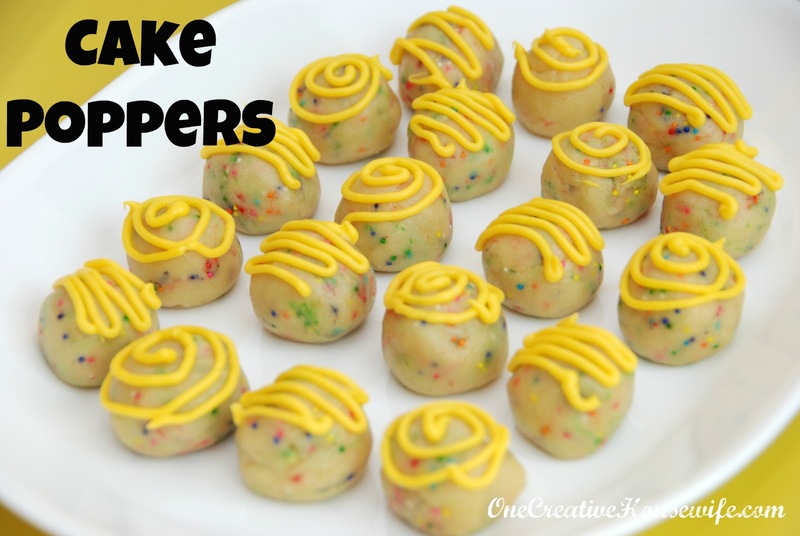 I have received multiple emails, asking me to share the recipe for the cake poppers that I talked about in the Little Miss Sunshine Party post. Since I am not one to disappoint, I figured I better hop to it! Recipe adapted from Chef In Training. 1. Cream together the butter and sugar. 2. Blend in the vanilla. 3. Mix cake mix, flour, salt into the sugar mixture. 4. Add milk to the cake mix mixture and stir. 5. At this point you should be able to form for the dough into balls without it crumbling or being too sticky. If you are having trouble, with this you may need to add a little more milk or flour to get your desired dough consistency. 6. Add sprinkles to the cake mix mixture and stir by hand. 7. Roll the dough into 1" balls and place on a parchment paper lined cookie sheet. 8. Chill balls in the refrigerator for 15 to 20 minutes. 9. While the balls are chilling, melt the candy melts* in the microwave in 30 second intervals. Stir between each 30 second interval. 10. Once melted, pour chocolate into a thicker plastic baggie (like Hefty) and cut off one corner, or into a decorating squeeze bottle*. I recommend the squeeze bottle* because the chocolate will be hot so it will be easier to handle. Plus the bottle will allow more control over the chocolate flow. 11. Decorate your poppers with a design, or letters and numbers to spell out a message. 12. Store the Cake Poppers in an air tight container in the refrigerator until serving. The original recipe from Chef In Training says that this makes 24-30 poppers. I wish I could confirm this but my kitchen helpers have a tendency of making things disappear before I get to count them. Thanks! You should definitely try them. I hope you have a great birthday!